Our day starts driving up to the Youth Hostel at Pen-y-Pass, Llanberis, Gwynedd. The morning was absolutely beautiful and the sky was clear blue. We were all strapped up in sensible walking clothes, sturdy walking boots and much needed walking poles. Lunch and extra layers were all packed in our rucksacks and away we went! We couldn’t help but stop at Pen-y-Gwryd to take a picture of the lake that looked like a sheet of glass and was absolutely breathtaking. When we arrived at Pen-y-Pass we decided to take the Miners Track up and then the PYG Track back. That way we got some really good views of the lakes; Llyn Llydaw and Llyn Glaslyn. At the beginning of the walk you can turn left along the Miners Track or right for an early climb up to the PYG Track with the walk covering about 8 miles of very interesting scenery. We turned left along the Miners Track which is one beautiful long, and for the most part paved, track up to the mine ruins (which is where we were supposed to turn right to join the PYG Track above us!). However, we were seduced by the frozen lake so stopped to take loads of photos and breathe in that amazing clean, crisp and very fresh air. The track was built during the 1800’s to serve Britannia Copper Mines which were abandoned in 1917. 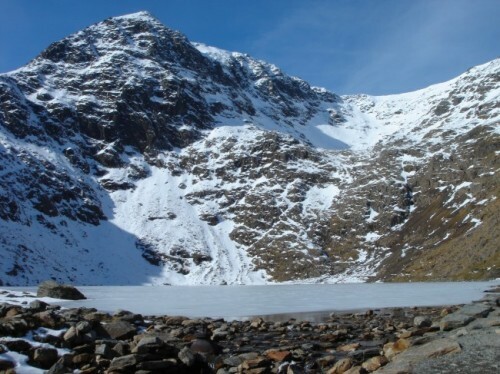 Mine Manager Arthur Lockwood drove his car to Llyn Glaslyn, and the track to this point at the lake still resembles a road so is a good walking surface. 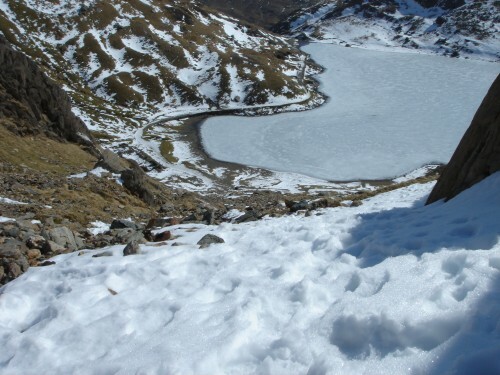 When the lake came to an end we followed some other walkers up a very steep and snowy path to where the summit lies. The PYG Track then meets the Llanberis Path and, at this point you turn left and follow the track to be at the top in about 10 minutes. 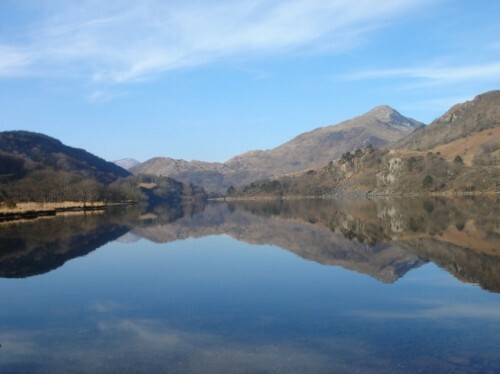 As with all Snowdon walks, you then turn back and walk the way you came. However, we walked back along the PYG Track to Pen-y-Pass taking one last glance back towards Snowdon and what was a fantastic and enthralling walk. It looks like you had just about a perfect day! Great photos. Did you come home to a bowl of Cawl? In fact, I made a big batch last week and am having Welsh Cawl for lunch today! We went up via the Pyg track and back down via the Llanberis path with weather which looked a lot warmer than yours. 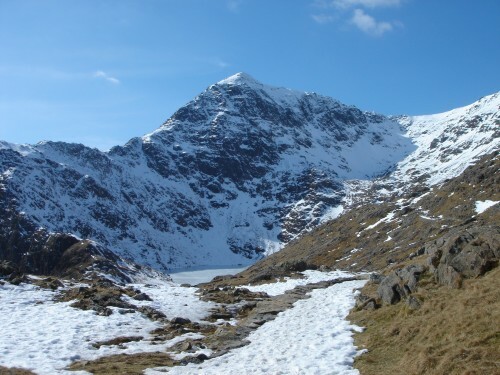 Snowdon looks beautiful with the snow cap although I’m still a confirmed fine-weather walker. Thanks for sharing your photos and your walk with us. That’s really excellent, I’m glad you enjoyed your trip so much!